Classic Track: “The Revolution Will Not Be Televised.” So nice it was recorded twice, first on his debut recording, Small Talk at 125th and Lenox, and again as the opening track to 1971’s more music-based Pieces of a Man. Scott-Heron’s “Revolution” has been sampled, synthesized, digitized, and name-dropped more times than we can comprehend. Like a gospel in the Bible of hip-hop, it’s what helped earn him his rap as one of the music’s founders. 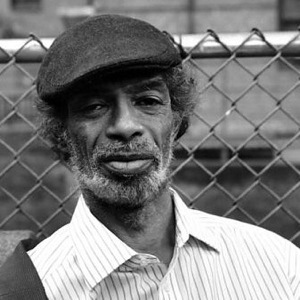 Career highs: His album collaborations with flautist Brian Jackson from 1974-1976 are foundational to Scott-Heron’s fusion of funky jazz with black-powered poetry and contain some of his best work, from the ghetto lament, “The Bottle” and the national confusion depicted in “Winter in America”, to the anti-apartheid solidarity anthem, “Johannesburg.” Scott-Heron has joined his music with activism, whether opposing nuclear power (“We Almost Lost Detroit”) at the No Nukes fest, or speaking out against Reagan’s presidential credentials (“B-Movie”). Career Low: Drug addiction led to time served on possession charges. Essential listening: The early works: 1971’s Pieces of a Man and ‘74’s Winter in America. And if you like those: The even earlier coffeehouse style and live percussion driven Small Talk at 125th and Lenox. After a 12-year hiatus, the comeback album Spirits, especially its “Message to the Messengers”, directed at all the young mcs out there, still sounds pretty fly, in a ‘90s way. Final Hour: I’m New Here, his 2010 recording on the XL label includes songs penned by Robert Johnson, the singer-songwriter Smog, and spoken-word clips of Heron’s own vintage poetry. Filed under: Gil Scott-Heron, "The Revolution Will Not Be Televised"